Moonachie, NJ is located in Bergen County in the Hackensack River watershed. Before 1987, the typical pronunciation of Moonachie was “moo-NAH-kee” until the former Mayor of New York City, Ed Koch, pronounced it “mah-NOO-chee” when suggesting that the New York Giants hold their victory parade there! Although the parade never came to fruition, Moonachie proves to be full of unwavering pride, enthusiasm, and hope. The dedicated volunteers of Jersey Cares are certainly no strangers to the community of Moonachie. Jersey Cares has partnered with several non-profit agencies in Moonachie to host multiple days of service and on-going volunteering opportunities. Jersey Cares volunteers on Jersey Cares Day! On Jersey Cares Day, one Jersey Cares non-profit partner agency located in Moonachie hosted 75 volunteers. In just three hours, volunteers planted flowers, painted line games, and assembled benches. In addition to their dedication on Jersey Cares Day, volunteers also contributed to beautify the community in the months following Hurricane Sandy. Jersey Cares partnered with the Hurricane Sandy New Jersey Relief Fund to host Sandy Service Day on the one year anniversary of Hurricane Sandy in October 2013. Over the course of two days, two non-profit agency partners received assistance from almost 300 enthusiastic volunteers, totaling close to 800 total service hours! Additionally, Moonachie hosted a corporate service project with BNP Paribas which aided in disaster relief by completing 30 Welcome Home Painting Kits that were donated to homeowners returning to their repaired homes that were damaged by the storm. The citizens of Moonachie spread their goodwill throughout Bergen County with weekly volunteer opportunities. They continually devote time to removing debris with Bingo Time in Paramus to socialize with our country’s veterans. We encourage you to lend a helping hand to the vibrant Bergen County community and visit the Jersey Cares Volunteer Opportunity Calendar. Named in honor of William Livingston the first governor of New Jersey, Livingston is a town dedicated to service – it supports an all-volunteer first aid squad and fire department. Livingston’s commitment to service doesn’t end with emergency services! They are also involved in many Jersey Cares initiatives. 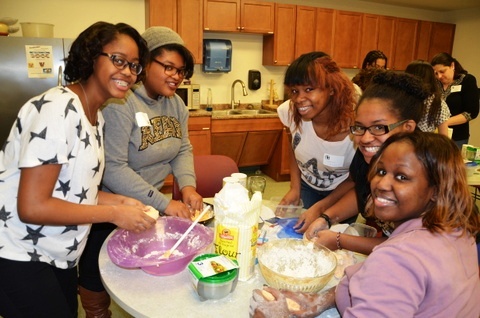 Jersey Cares volunteers on MLK Day making homemade play dough for sensory kits. Last fall, two corporations gave their time to volunteer in Livingston. ImClone Systems and Mondelez each engaged 30 volunteers in revitalization projects. At a high school which serves students with disabilities, ImClone volunteers created an interactive pumpkin patch and helped students pick and decorate 100 pumpkins while Mondelez employees volunteered at a community center beautifying the facility by landscaping and planting seasonal flowers and shrubs. Combined, both corporations served over 225 hours in the community. Last winter, Livingston citizens, business groups and civic organizations collected 165 coats with the Jersey Cares Coat Drive. This past Martin Luther King Jr. Day, 30 volunteers created interactive crafts including rain sticks and homemade play dough as a part of sensory kits that were donated to a center serving children and teens with cerebral palsy. Additionally, on The 16th Annual Jersey Cares Day in May, 25 volunteers decorated inspirational and motivational posters that were used to help cheer on the center’s students during their spring fundraising walk. Through these efforts, nearly 300 kids were served! Livingston is a small town with a big heart! To find out how you can contribute to the tradition of volunteerism in your community visit www.jerseycares.org! Plainfield is a city in Union County, New Jersey and has experienced exponential growth according to the United States Census. As of 2010, the city’s population increased to 49,808 – supposedly the highest ever recorded population in any decennial census! While Plainfield continues to grow in population, its citizens also grow in the number of places and ways they volunteer! Last winter, Plainfield civic groups and businesses collected as many as 680 gently used and new coats and distributed them among four non-profit agencies through the Jersey Cares Coat Drive. Additionally, 183 children received holiday gifts through Frosty’s Friends, the Jersey Cares winter gift giving program. Nearly 80 corporate volunteers from Boston Consulting Group braved the chilly winter months and gave back over 300 hours to a Plainfield public middle school. These dedicated volunteers painted murals, planted flower pots, built four picnic tables and five bookshelves, totaling 308 hours of service that will benefit almost 750 students for years to come! 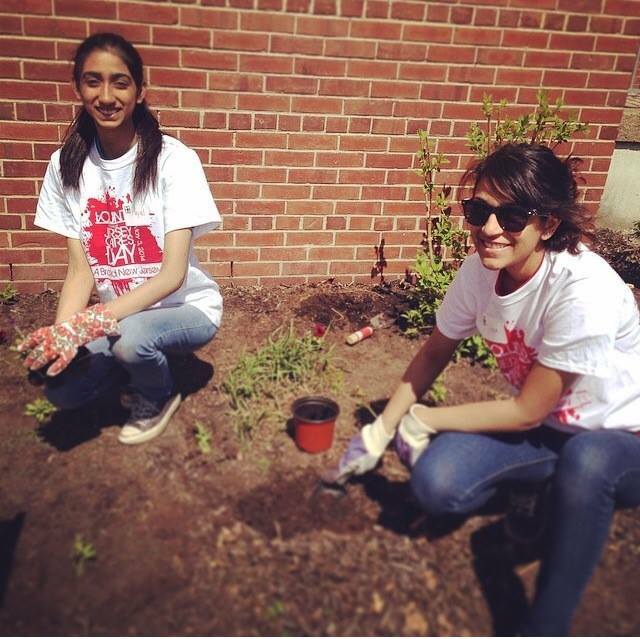 The warm spring temperatures brought even more eager volunteers to Plainfield! During the 16th Annual Jersey Cares Day, volunteers revitalized a Plainfield charter school by painting line games, walls and planter murals. Volunteers also gardened and assembled picnic tables, benches and bookshelves. This hard work totaled 326 hours of service and assisted about 750 children. Not only is Plainfield dedicated to volunteering, but all Union County residents dedicate their time to others! Through the Volunteer Opportunity Calendar, Union County volunteers leverage their strengths to meet the needs of four non-profit agencies. On a weekly basis, you can find Jersey Cares volunteers socializing with seniors at Bingo Time in Berkeley Heights or sorting and packing food donations at Mobile Meals in Elizabeth and Marketplace in Hillside. Twice a month, our tech savvy volunteers teach computer skills to adults at Computer Essentials in Elizabeth. Plainfield’s numbers have seen a steady increase in the recent years and we hope that along with more citizens comes even more enthusiasm for volunteering! For fun and exciting volunteer opportunities 365 days of the year, visit our website!